about 73% of downloads since launch have been from users outside the U.S.
And per country and locale at the same time? 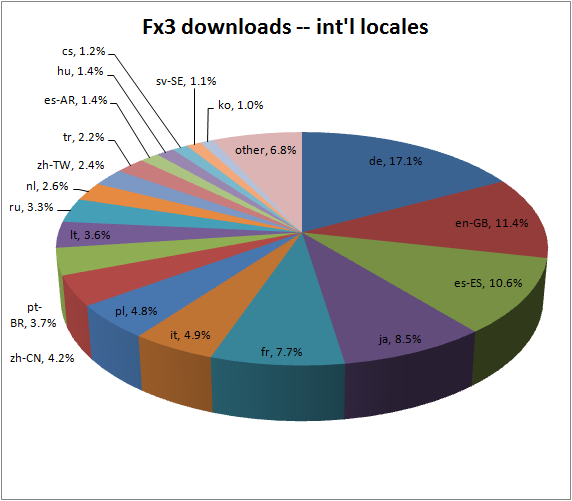 That is, for exemple for Spain, which is the percentage for all downloaded locales. Toni – for ca (Catalan), we’ve seen about 38,000 downloads of Firefox 3 since launch… nearly 0.5%! Getting country and locale at the same time is a bit tricky. We’re working on it and hope to post some data shortly. Hmm… I see that none of the Indic locales feature in the pie chart as individual entries. Does that have any impact on Mozilla’s interest in Indic ? So there are about 300.000 users of the Dutch Firefox translation. Good to know! Just wonder how many Dutch users are using the en-US version (I expect it to be higher than the average). What are the stats for the Greek language (el)? Could you pls give me the total downloads for ‘si’ locale. It may be less, but I want to know as we released it for the 1st time. Could we know the stats for ‘eu’ locale please?